HP CM8000 Color MFP series helps improve productivity and control operating costs by delivering a powerful combination of features, including best-in-class performance, best-in-class operating costs, best-in-class reliability, and intuitive usability. • Average print speeds of 50 ppm color, 60 ppm black, and maximum speeds up to 71 ppm color or black. • HP pay-as-you-go service options include a two-tiered pricing model to keep color costs under control. • HP's Color Accent feature allows users to add a dash of color to printed pages at no extra cost. • A robust print engine and minimal service requirements keep maintenance costs low. • Intelligence built into Original HP printing supplies optimizes print quality, system reliability. • Eliminate internal and external threats to your equipment and data with HP's security framework. • Install, configure, and manage HP CM8000 Color MFP series from anywhere on the network with HP Web Jetadmin. • Spend less time managing print drivers with the HP Universal Print Driver Series. • Embedded HP Jetdirect print servers simplify printer sharing, increase efficiency, and reduce costs. • It's a fast, top-quality color copier/printer and a low-cost, good-quality color copier/printer. 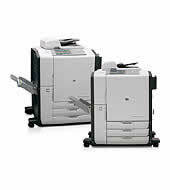 Compared to department-class color laser MFPs below $22,000. Speeds as published by manufacturers as of August 2006. Test methods vary. Compared to department-class color laser multifunction products. Operating costs are the combined price per page of service, repair parts, and consumables (exclusive of paper) over a monthly timeframe, based on manufacturers list pricing as of August 2006. HP office printing costs based on estimated ink prices and preliminary yield. Compared to department-class color laser multifunction products. Based on independent third-party data, HP testing, and internal review of competitive products. As of August 2006. This estimate is for red copy in 10-point Arial font, underlined. Red is the worst-case color as far as ink usage. Other colors in the same font and same point size may allow for as many as 115 characters. If the fonts were changed to Times Roman, the limit would increase to 135 characters (serif fonts are thinner and use less ink). Buyer's Lab gave HP a Pick of the Year award in December 2006 for Outstanding Achievement for the User Interface Design of its Multifunction Printers. Average print speeds of 40 ppm color, 50 ppm black and white. Maximum speed of 57 ppm color or black and white. Average print speeds of 50 ppm color, 60 ppm black and white. Maximum speed of 71 ppm color or black and white. This page is part of GeneralManual.Com Network HP CM8000 Color MFP series User Manual.